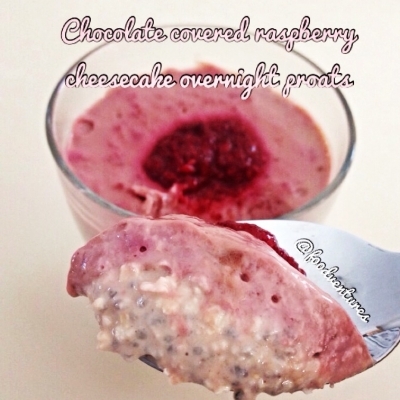 Chocolate and raspberries combine to make this magically delicious overnight proats. also has the option to be made dairy free/vegan! Chocolate covered raspberry overnight oats â€“ can be made gluten free if using GF oats. Can also be made dairy free and vegan if subbing almond milk, dairy free yogurt, and a vegan chocolate protein powder. 1) in one bowl, combine first 3 ingredients and set aside. 2) In a second bowl, combine your greek yogurt and milk until smooth and creamy. add the almond extract and protein powder and mix well. add half of this mixture to your first bowl. 3) heat your raspberries in another bowl until they soften. add the raspberries (be sure to save some to for topping) to your second bowl. mix well and add to your first bowl. top it off with a few raspberries then let chill overnight in the fridge and enjoy in the morning.